The latest recipe swap theme was “Too Hot to Cook”. We’re lucky enough to have central air, so it’s very rarely too hot for me to turn on the oven. More likely, when the warm weather hits in force, I’ll get lazy and not want to stand over the stove. This meal is really perfect for days like that. I’ll admit I wasn’t really sure how well this would go over, but the fresh lettuce and tomatoes, something I wouldn’t normally put on a hotdog, really gave it a nice, fresh taste. As an added bonus, my husband fastly prefers his hot dogs microwaved so this meal took just about five minutes to put together, start to finish. Place shredded lettuce and chopped tomatoes inside the toasted bun. 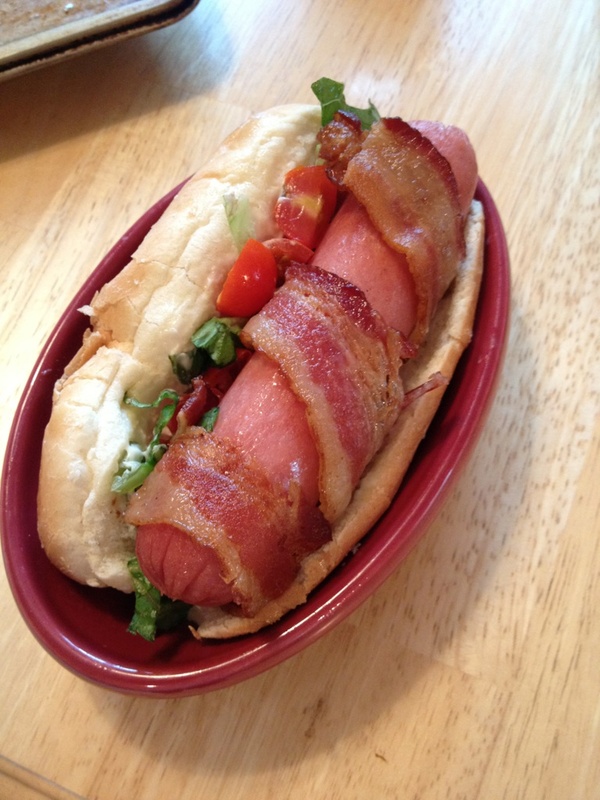 Wrap the cooked hot dog with bacon and add to bun. Yay! I’m glad you liked them. I was very skeptical at first about the lettuce and tomato on a hot dog. And the picture is beautiful! Why have I never thought to wrap my hot dogs in bacon or give them the royal condiment treatment?? This looks so delicious and I can’t believe how fast it is! It may just be added onto this week’s menu. Thanks for sharing!